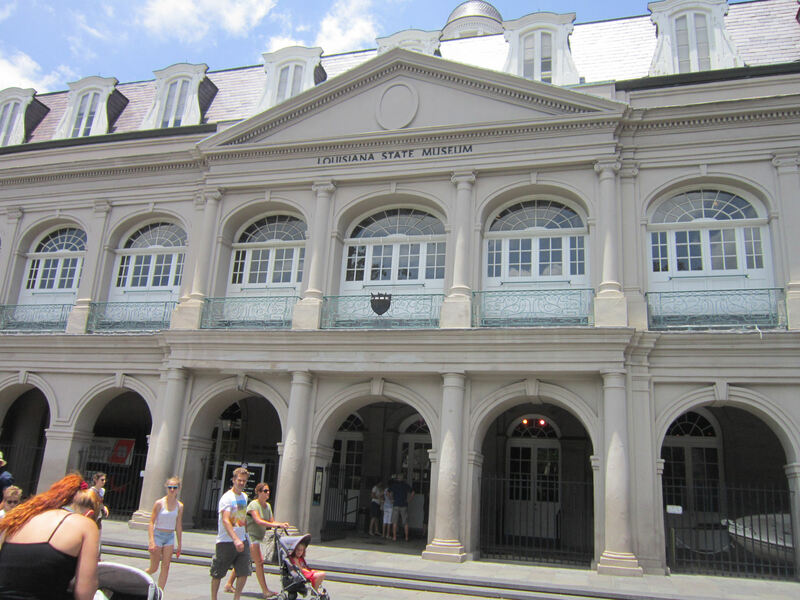 2015 Road Trip Photos #31: NOLA History Trilogy « Midlife Crisis Crossover! 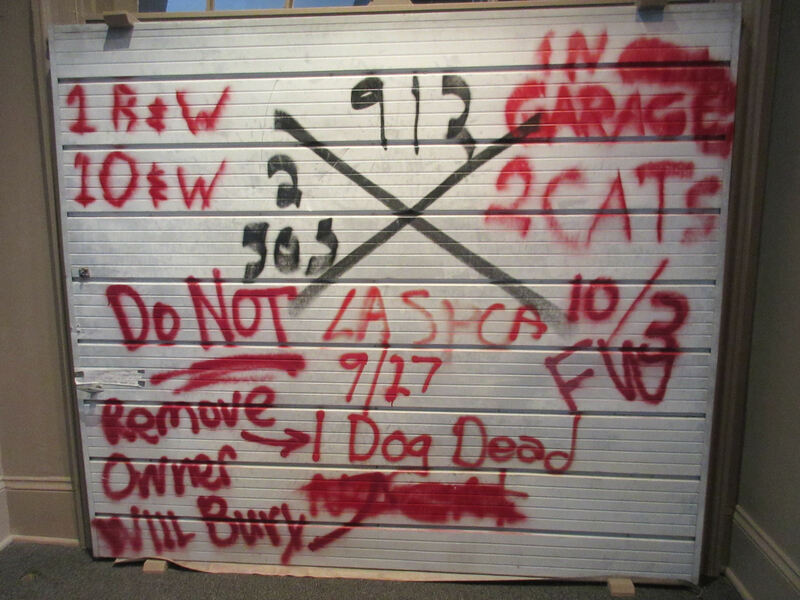 This garage door used as a desperate message board is one of several Hurricane Katrina fragments on exhibit at the Presbytere. 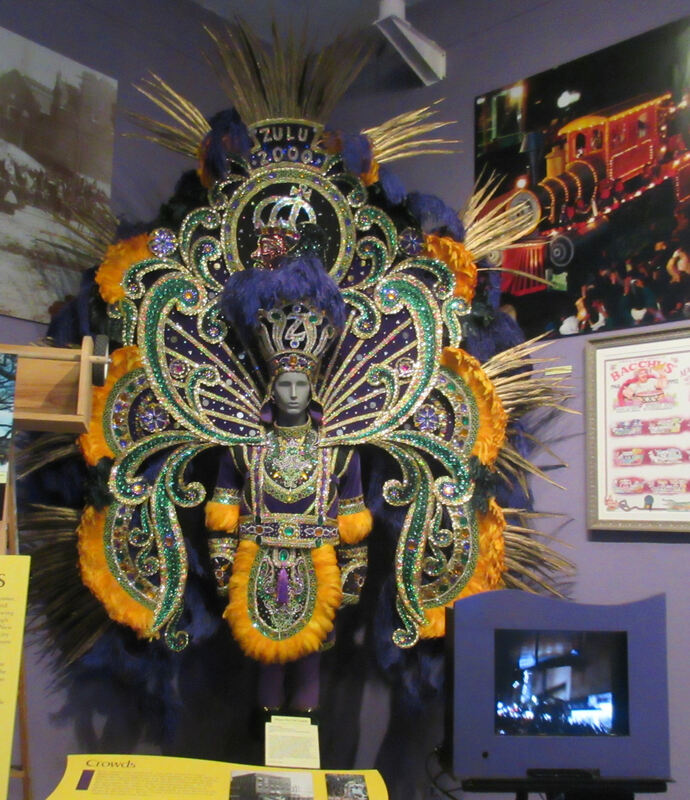 The Louisiana State Museum is no single building, but rather a statewide aegis for several full-size museums and a few structures of historical significance. Over half are in New Orleans; one of those, the Old U.S. Mint, sits near the north end of the French Market. After lunch on Day Four we sped through three such locations bordering Jackson Square — two on either side of St. Louis Cathedral, the third nestled in one of the quaint strip malls, cleverly disguised as one of many gift shops. This one’s hard to spot because it’s tiny and squished. It’s also a few doors down from a visitors’ center where we met a man with the most authentic Cajun accent we heard all week. If you’re a fan of authentic restorations and recreations of what life was like in previous centuries, the 1850 House is one of those, compact but ornate in spots and retaining much of the original 165-year-old materials. We already had a historical house visit scheduled in another state later in the week, so we didn’t dwell on this one for long. And it’s where they did all their harping. 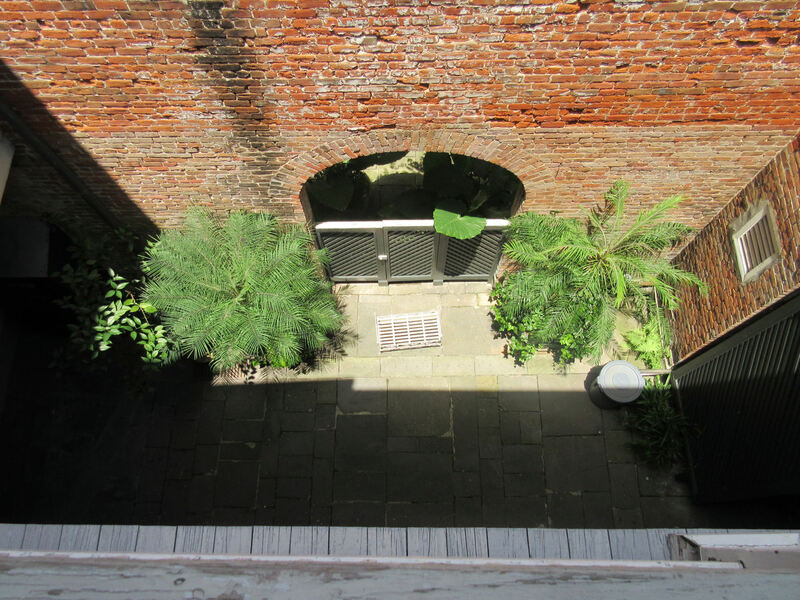 The backyard, or “courtyard” as the natives called it, was largely an extra workspace for household chores rather than a recreational getaway. The feng shui wasn’t quite right for a barbecue party. Its exterior gives the impression of a One True Louisiana State Museum, but this was once intended as a home for St. Louis clergy. Before that, Capuchin monks lived in a previous building on this ground back in the eighteenth century. It was built up and used commercially before the state bought it in 1908. But “The Presbytere” would be a more confusing sign to us uncultured strangers. We’d mistake it for a Presbyterian church, come inside for worship, and then get even more confused. 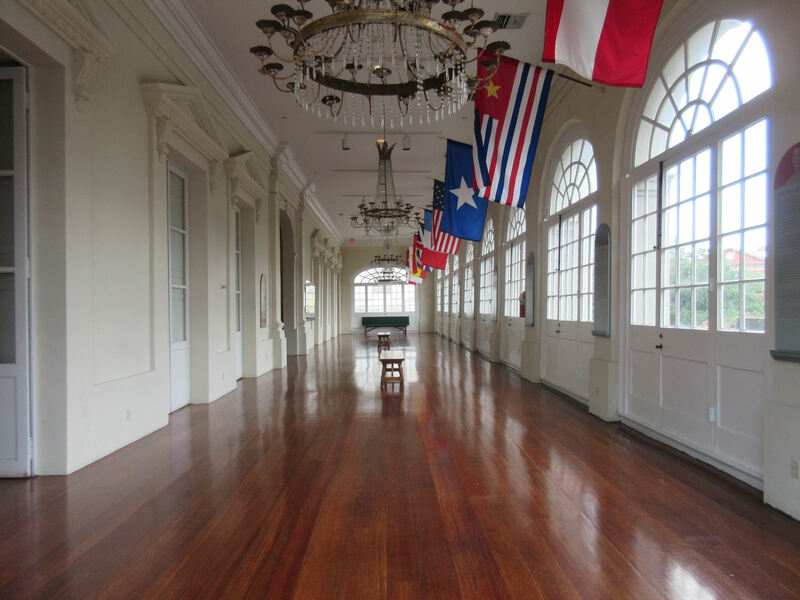 As soon as you walk in, the first exhibit looms overhead, Mitchell Gaudet’s 2010 Hurricane Katrina response “Message of Remembrances”. 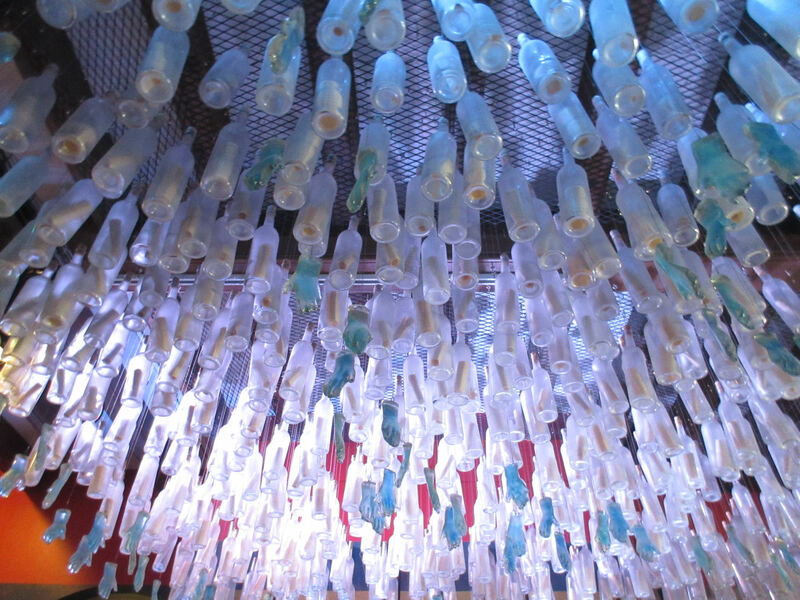 The messages-in-bottles are like prayers for those lost; the blue hands symbolize the rescuers who came from near and far. True story: I never noticed the hands until I stared really hard while uploading the pic tonight. I’m dense sometimes. 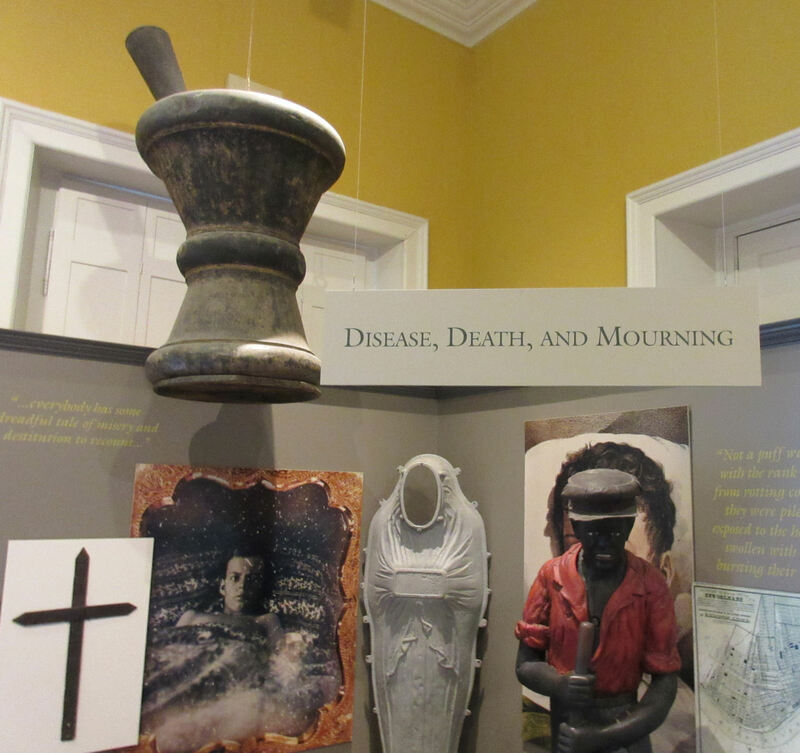 The Presbytere’s ground floor is entirely about Katrina — a timeline of events, news footage and interviews, and relics of the destruction and the chaos that followed. 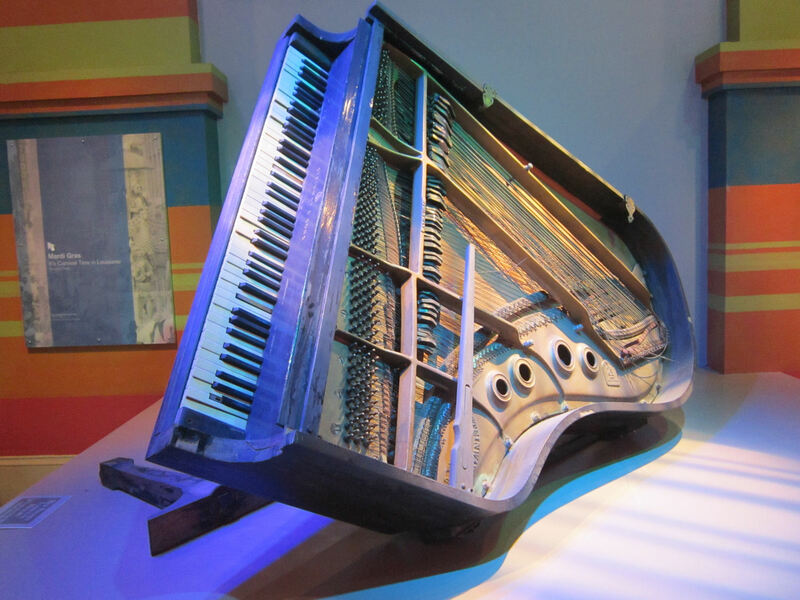 Past the greeters is what’s left of another one of Fats Domino’s pianos. This one’s even less playable than the one over at the Old U.S. Mint. Pete Fountain’s clarinet was recovered in its original case a mile away from the remains of his house. Water damage rendered it likewise unusable. 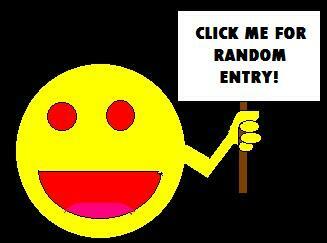 Squint at the bottom and you’ll note the bell is bejeweled. 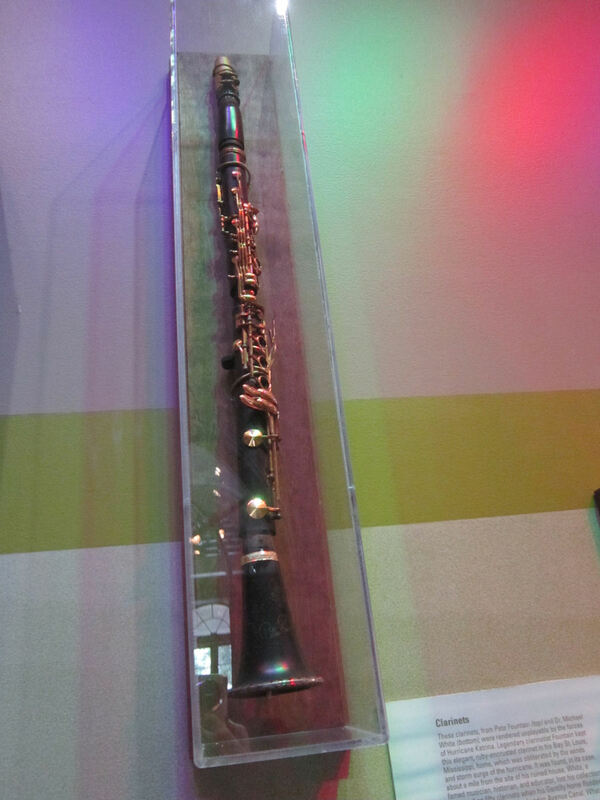 This was no mere spare clarinet. 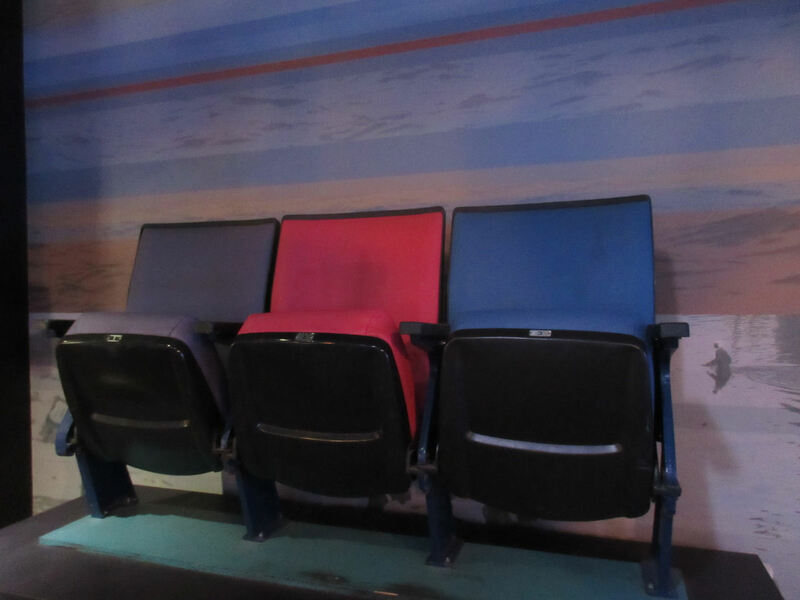 Three seats were saved from the Superdome, which served as horrid living quarters for over 13,000 evacuees in the wake of destruction. Months of renovation later brought it back to life in time for the New Orleans Saints to resume playing home games for the 2006 season. All the Saints’ 2005 home games were understandably moved to venues in other cities and states. They ended that season with a 3-13 record. I’m guessing they were distracted. 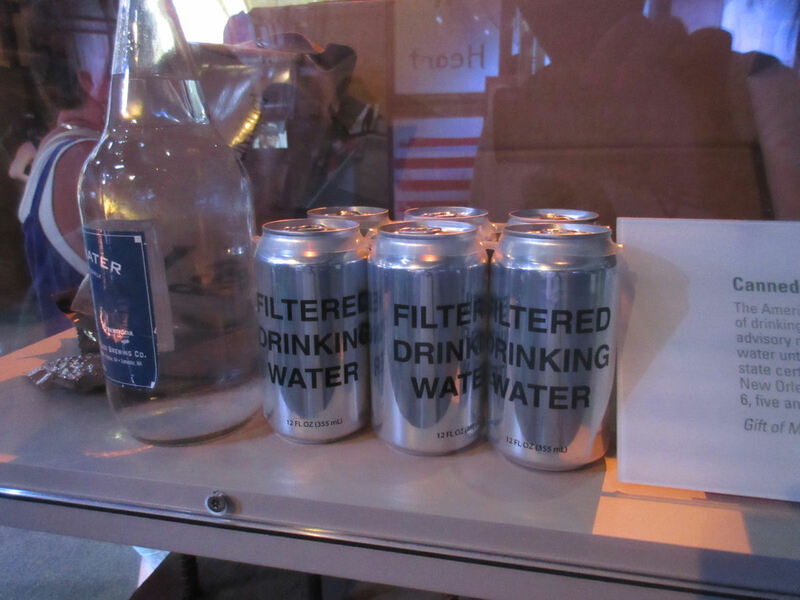 Canned water is a grim reminder of the limited emergency supplies on hand throughout the post-hurricane ordeal. No idea if this was also available in money-saving 24-packs. 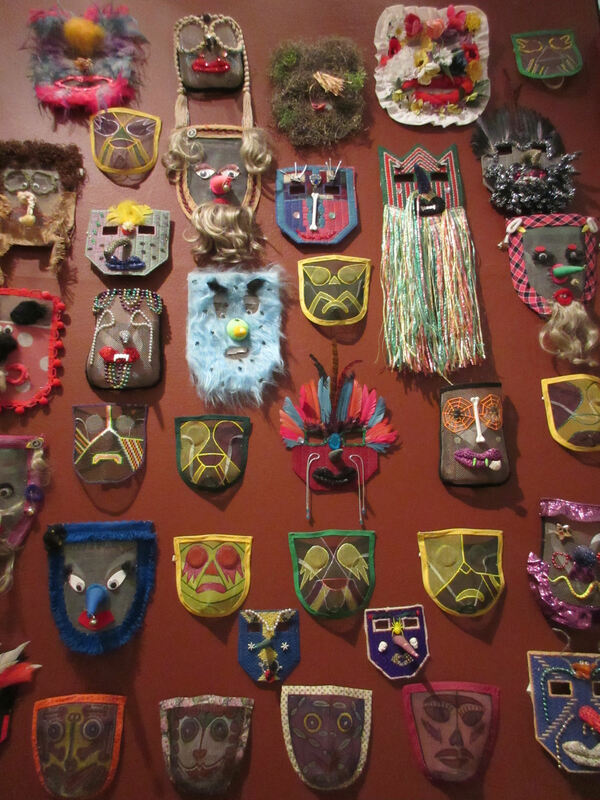 The Presbytere’s second floor, the complete tonal flipside of the first, is all about the whimsy and wonder of Mardi Gras. 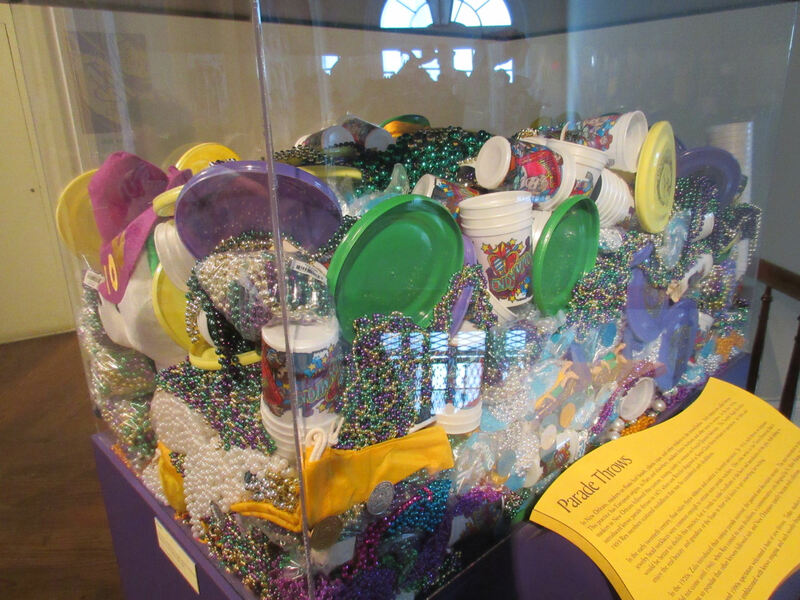 We’d seen a bit of that at Mardi Gras World, but here were a few more aspects. Pretend this is an illustration for a sad listicle called “If Disney Princesses Were Mardi Gras Masks” and then get into fistfights with friends trying to decide which goes best with whom. Mardi Gras isn’t just about revelry and debauchery. It’s also about style. A selection of real Mardi Gras litter strewn about the streets by partygoers who couldn’t keep a tight grip on their accessories. 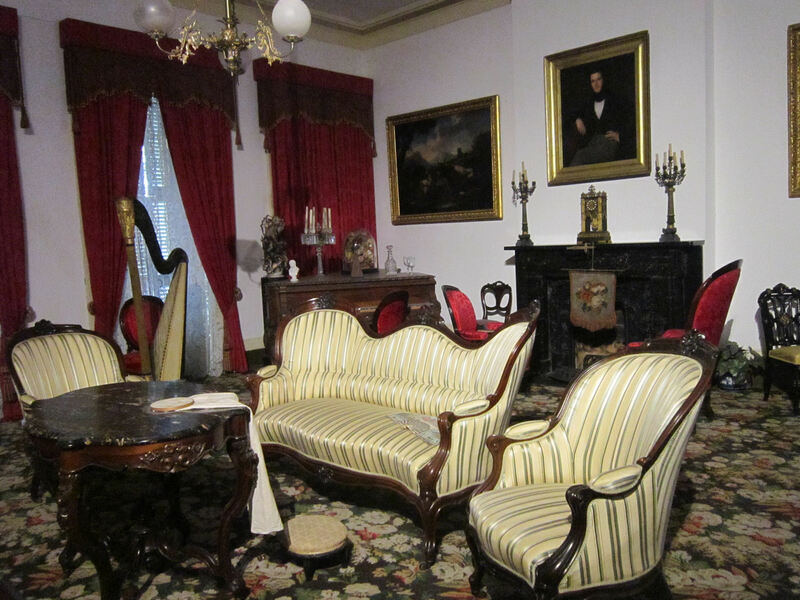 The Presbytere’s sister building dates back to 1799 and was mostly used as offices until it joined the Louisiana State Museum family. The first floor is your basic natural history section you’ll find in every State Museum in every state — Native Americans, colonial life, etc. 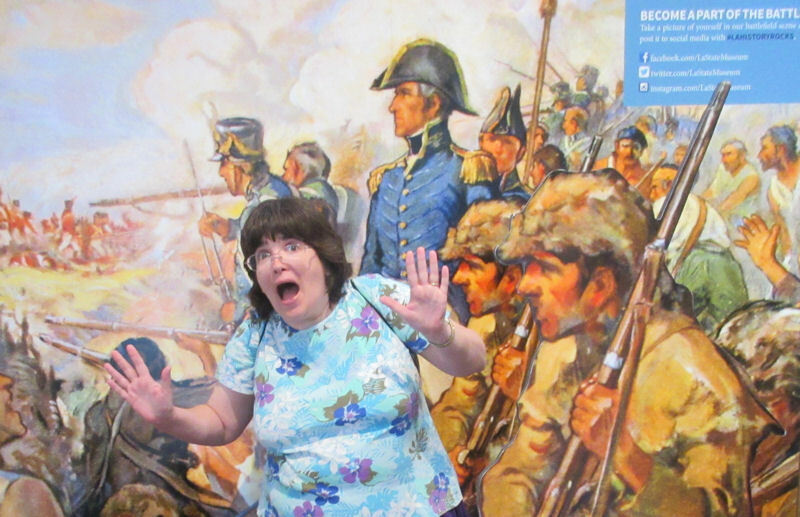 The second floor livened up a bit with its focus on the Battle of New Orleans, the last major skirmish between America and England in the War of 1812. My favorite part was a tangential, light-hearted video about buccaneers hosted by New Orleans native Bryan Batt, best known as Mad Men‘s erstwhile art director Sal Romano. The Battle was a major accomplishment for General Andrew Jackson, which is why his face and name popped up a lot all over town. 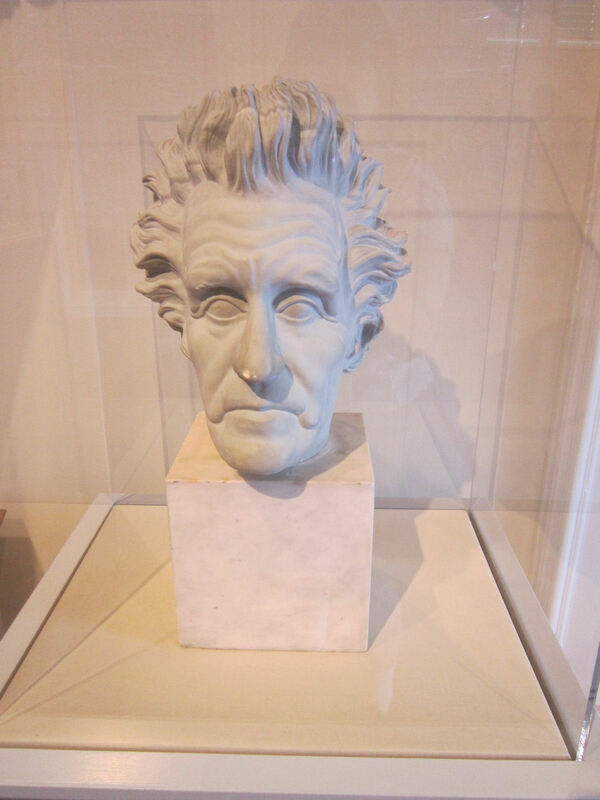 This sculpture of Jackson’s severed head may have been a calling card from one of his mortal enemies, or maybe it’s just a bust as well-meaning tribute. The war’s grand finale was commemorated in folk singer Jimmy Driftwood’s “The Battle of New Orleans“. 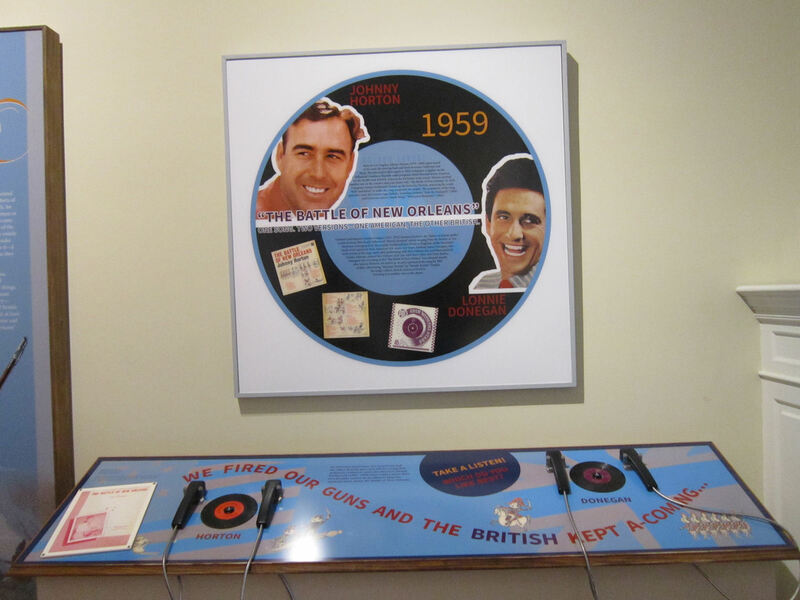 A cover by country singer Johnny Horton was the #1 pop single of 1959 according to Billboard Magazine. What 80% of the Cabildo was like, more or less. This second-floor gallery had nothing going on except flags, but it was a nice place to sit and rest before we had to return outside to the sweltering summer. …and that was it for museums and historical organizations for at least the next eighteen hours.